For displacements up to 250 cm3 revolution. 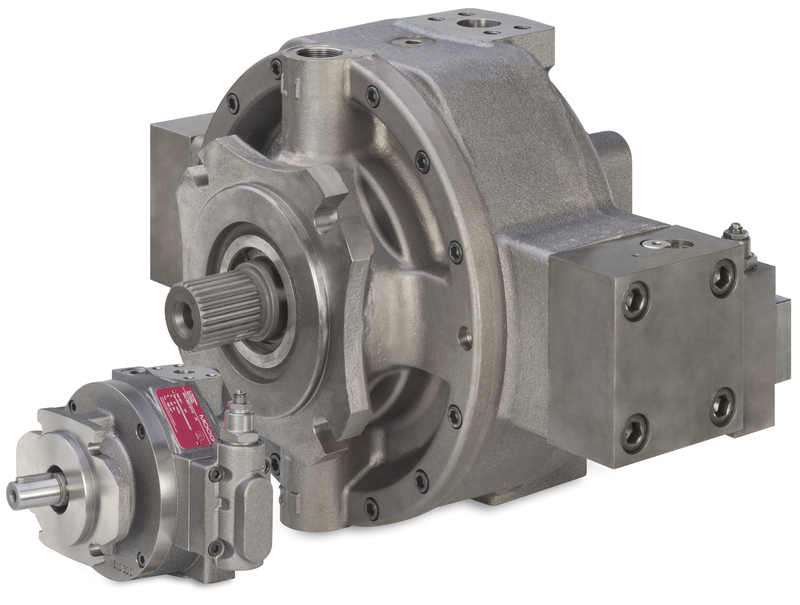 Moog extends its range of variable-displacement radial-piston pumps, with the new RKP 250 for displacements up to 250 cm3 revolution. The biggest model of the Moog RKP series is ideal for applications requiring high-pressure values, like for instance metal forming machines, presses, forming or blowing machines or other types of machinery for industrial use. The radial-piston pump can machine with continuous pressures up to 350 bars (5000 psi), also standing out for its sturdy design and its high reliability, in aggressive environments, too. RKP 250, for applications in machinery where even higher displacements are required, can be configured in double-pump version, granting the availability of the highest torque up to 500 cm3. Besides, it can be coupled with other pumps of the same series and with SAE standard interface (A, B, and C). The small axial size of the RKP range makes them available for multiple and compact configurations. RKP 250 provides a highly dynamic flow rate and pressure control. It is designed for uses in open-circuit systems, the big suction duct and the optimized flow grant suction performances at high rotation speeds, keeping the noise emission low. The pump, with a maximum speed of 1800 rpm and a minimum suction pressure of 0.8 bars (absolute pressure), can operate with machines installed at high height, without needing the use of a preload pump. RKP 250 integrates a pump group composed by 9 rotating pistons, whose configuration assures low- pressure pulses and minimal noise emissions. Like the other models of the RKP range, this pump is equipped with Moog displacement control system with sliding stroke ring. The exclusive use of metals and treated contact surfaces, particularly resistant to wear, grant the longest service life in time. Special versions are available for the use with fluids like HFC and the synthetic HFD. Besides, the RKP-D provides for the pressure and flow rate control by means of an active system of high-dynamics electro-hydraulic actuation, completely and easily configurable with the dedicated Moog software. The information about the status, the set values and the real values are displayed in graphic modality, permitting a fast and simple performance monitoring, the solution of problems and the setup. In line with its modular design standards, Moog offers also the various typologies of compensators for the RKP 250 pump: pressure (F2), pressure and flow rate (R1), fixed displacement (B1) and double displacement (N1). Finally, RKP 250 will be available also in anti-deflagration version. Hamasger 4 Mifratz Haifa Israel. P.o.b 10507 Mifratz Haifa 2629012 Israel. we are glad you appreciated the content of our magazine Power Transmission World.